Wade ashore on a postcard-perfect beach, crunchy coral sand between your toes. Your sailing ketch bobs at anchor in the cove. Hawksbill turtles break the surface, bobbing up for air. Brightly-striped angelfish and butterfly fish dart about within the shallows, nipping in and out of corals, blue-tongued clams and gently waving anemones. At night the Milky Way gleams so richly it looks positively creamy. 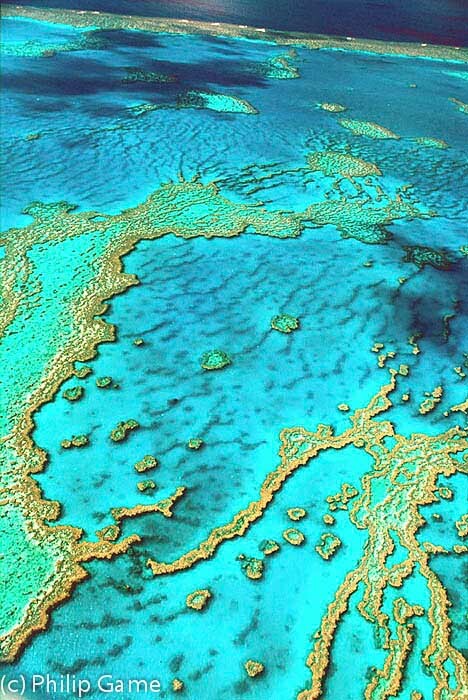 The Whitsunday Passage runs through a chain of islands in the Coral Sea, best reached from Brisbane. Fringed with luridly-coloured coral reefs, these are drowned mountains clothed with dense forest. Back in the city, my mind’s eye lingers on the area’s natural beauty and the abundant animal and marine life. Original images were 35mm Fujichrome or Ektachrome transparencies. Hi-res. scans are available for licensing, please visit www.travelgame.org. Its awesome. No one can explain the natural beauty of the Whitsunday islands in few words.